VirtualGPS Lite freeware for smartphone, Windows mobile phone free downloads. VirtualGPS is a free, small utility, which fully emulates GPS module and returns your location (by using cellular towers). Accuracy of coordinates is about 200m in urban area and up to 5km in countryside. Screenshots are explaining how to use VirtualGPS with navigation software (e.g. "Google Maps"). 1. Google "my location" feature works only with google maps, while VirtualGPS works with any navigation software. 2. VirtualGPS supports wider range of devices because it uses 3 modes of getting cellular info instead of one like in google maps. (e.g. google maps does not work with IPAQ Voice Messenger, but this program does). 3. VirtualGPS can work in PDA without phone module, see AT mode. 1. Check the internet connection on your gadget. 2. Run VirtualGPS, wait about 1 minute until GPS: ON (or OFF in case of no reception) is shown. 3. Do not quit the program unless you need it. 4. Run navigation software. 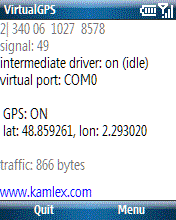 In the settings put GPS on COMx (Port is displayed on the main screen). 2. MEM mode. (memory reading for OMAP processors, does not work for UMTS). Before start you can be asked about MCC and MNC values. These values can be found here. E.g. for Germany MCC must be 262. 3. AT mode. (AT commands are used, can work as a linkage of simple mobile phone and PDA without phone module, both devices can be connected via bluetooth or IrDA). Starting of this mode can take up to 3 minutes. 0, 0, 0, 0 or -1, -1, -1, -1 is showing on first line. Current mode is not supported by this device. 1. Check an internet connection. 2. Position of current cell is missing in the database, change your location. Pro version may also help. GPS: ON but navigation program can not connect to GPS. Probably two navigation programs are trying to connect to the one port. Note, only one program can use simultaneously VirtualGPS. If you still have problems, run VirtualGps for at least 2 minutes. Then press "Menu"->"Log"->"Save To File", quit and send log.txt to the contact email. The company seems to have disappeared. just got it haven't tried it yet ill let you know. Unable to get free version to work with Motorola Q phone and Windows Mobile version 5.0. Get error "GPS: off; cellular triangulation: device not supported". Tried using Phone Settings/Network of "GPS=Location On and 911 only", both failed. Network selection=automatic. You have $ 495.00 Credit . Cool, an extended tnarrawy that paid off! I very much wanted a Garmin 550 because it automatically lines up several addresses in order so that it would send me to the closest address, next closest, etc. The model 550 also has an anti-glare screen which is pretty important.All they had was a Tom tom. I returned the Tom Tom in three days and paid re-stocking fee of 75 or 80 dollars Tom Tom was not satisfactory at ALL for reasons that I will not go into. Ended up with Model 330.It is not legal in California to use devices that attach to the windshield. Also, my 70 year old eyeballs are not all that cool. I drilled two holes through the round base, through the rubber and all and right down into the instrument panel to the right of the speedo cluster. The thing is now perfect, about 12 closer than where it was on the windshield. I could just kiss that GPS every day. Modesto and Bakersfield are two cities that are HORRIBLY cut up with railroad tracks, rivers, old and new overpasses, poorly planned areas mixed lighting, all kinds of trouble if U don't have GPS.And you just don't need updates. And you do not need monthly fee services such as traffic and weather.Remember also the other advantages of GPS; It tells you when you are going to arrive at your destination at your present pace. It tells you how far to the next turn and where to turn to. If you need a motel it lines up a BUNCH of them, from the closest on and in which direction and how far away.. Select a lodging and it pops up an address and a phone number. Same with gas station, stores, food.It never locks up or turns blue and dies like some piece of crap Microsoft thingy.